Douglas County School District Superintendent Trent North apologized to a Douglasville, Georgia family in a voicemail for a role their daughter was assigned in school play that was inappropriate for seven-year-olds. They complained that a teacher at the Burnett Elementary School in Douglasville assigned their seven-year-old daughter to a “white segregationist” role without telling them or asking for their consent. The 7-year-old student, Anastasia Bertram, who is “the only white girl in her class,” according to her father, caused outrage. Her parents withdrew both she and her sister from the school after the incident. The parents were never notified about their daughter’s role in the play, they argued, and had no idea about the play’s theme until they were sitting in the audience. 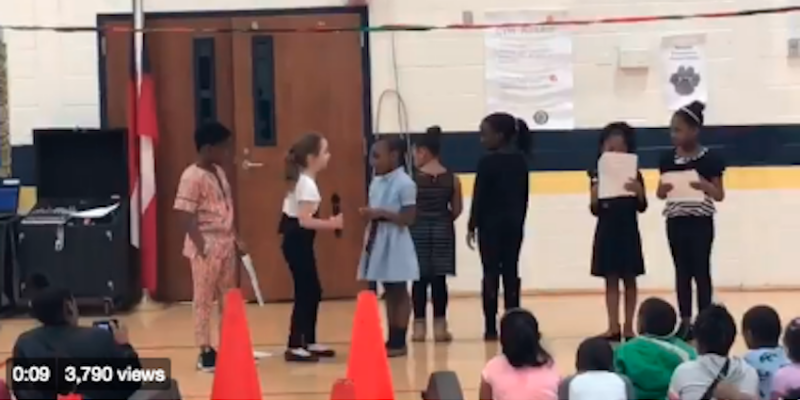 In a video of the play, Anastasia as the segregationist, yells at her all black classmates to “go away, you don’t belong here!” She also held a sign that read, “Go home,” on one side and “Cursed is the man who integrates” on the other. The girls were transferred to another school approved by the district.